The novels of the Dresden Files have become synonymous with action-packed urban fantasy and non-stop fun. 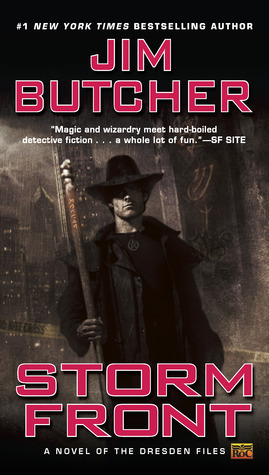 Storm Front is Jim Butcher’s first novel and introduces his most famous and popular character-Harry Dresden, wizard for hire. For his first case, Harry is called in to consult on a grisly double murder committed with the blackest of magic. At first, the less-than-solvent Harry’s eyes light up with dollar signs. But where there’s black magic, there’s a black mage. Now, that black mage knows Harry’s name. And things are about to get very…interesting. I’m having a hard time reviewing this book. I enjoyed it – there was a lot of action (which I love in UF) and I loved Harry Dresden. That being said, the book is a little weak in the whys of certain plot points. I didn’t understand why Harry didn’t trust Murphy enough to be even slightly honest with her. That made me a little PO’d several times in the book. Especially as she comes across as a good friend. IMHO the strongest parts of this book are the characters. I really liked Harry, Bob, and Murphy so I plan to read more in the series based on my enjoyment of the characters alone (also this series was recommend to me by a person who’s opinion I greatly respect).